I don't know how the weather has been for everyone but in my neighborhood, the sun has been out and shining in full force! It seems that Spring has sprung early and in lieu of that, I wanted to share with you one of my favorite Spring and Summer hairstyles: the fishtail braid. Braids have been a huge trend for the last couple of years and I know it's going to be seen all over the place this year as well. I've been sporting the fishtail braid quite frequently lately since it's so easy to do yet looks very complicated as a finished product. 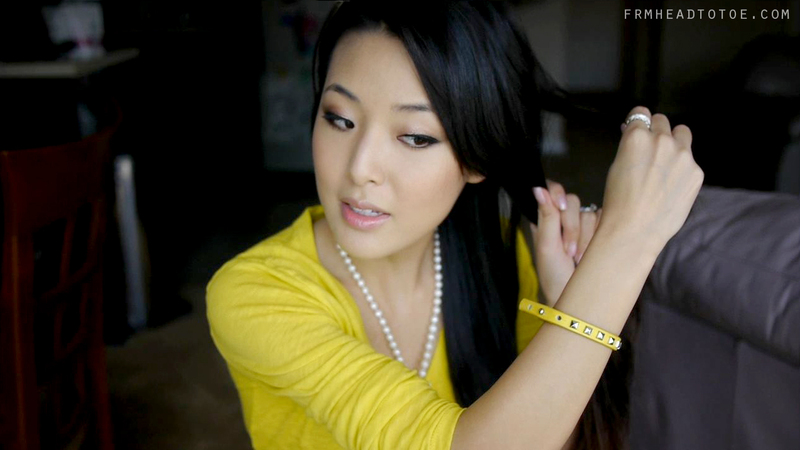 Many people must've thought the same as well since I got so many requests for a tutorial after wearing this hairstyle in my Sister Tag video. Although I'm sure it is much, much easier to understand by watching the video above, I also wanted to include a few photos for those of you new to the fishtail braiding process. This is the standard technique for how to fishtail braid your own hair. To finish the look, I loosened up some of the sections to make it look more messy-casual and added a rose gold bow hair tie to give the braid polish. I also included a second (easier) technique for a softer fishtail braid in the video as well in case the traditional technique proves to be a little tricky. ;) You can check out my past posts on hair here if you'd like to see more tutorials as well. I hope you guys enjoyed the tutorial and if you try out this hairstyle then feel free to leave a pic of your look on my Facebook page. Let me know in the comments below what tutorial you'd like to see next! 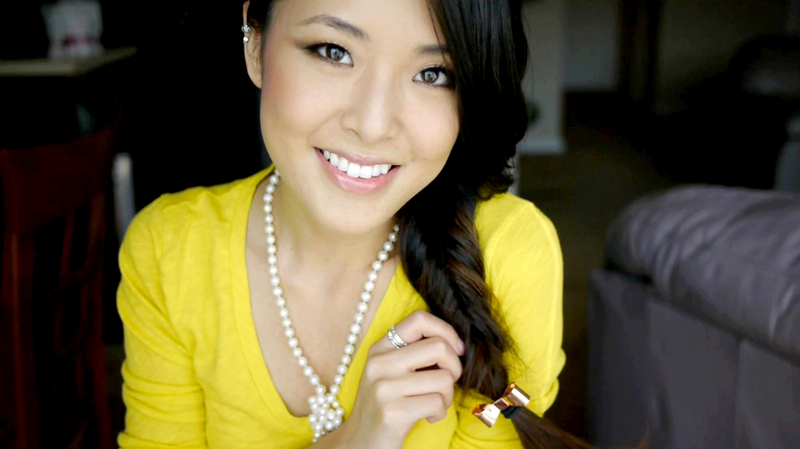 I love the look of fishtail braids :3 And they are super easy to do! tried it and got it did it in just 1 try... thank's to you jen! Hey Jen I have been following you for several years and I've been meaning to ask you this question. Do you and your husband not want kids? If you guys don't then why not? I know you are taking birth control pills so I was just wondering. I took my regular pearl necklace and kept it unhooked like a lariat necklace, then looped the ends into a knot. DIY knotted necklace! the bow hair tie is cute!! I love this hairstyle, i will definitely try it out! that is really helpful! thank you- i've been wanting to try this hairstyle out and never understood the other tutorials as well as yours. Check out my giveaway when you have time. Thanks for the video and photos, it's looks super easy! I did it and looks amazing, it's super cute! I have curly hair but it's ok! You look very beautiful in yellow! The color makes your facial features pop out! Jen, thank you so much! i just did it and it's soooo pretty! Hugs!! also love your makeup, especially eye makeup ^^!! Hi Jen, is there a legitimate place to buy BB cream online? There seems to be a lot of fakes out there and many customers who have been fooled? Are there any sites you would recommend that sell authentic products imported from Asia? Thank you Thank you Thank you! The tutorial was super easy. I think even I will be able to manage a reasonable braid now. After years of failing with a 3 strand. I love love love your hair... I wish I never cut my hair short last year as it is taking me forever to grow out again! Can you please do a new tutorial on your hair care rotuine and what products you use to keep your hair looking so healthy and great? Hi jen!!! Just want you to know your tutorials changed my life so much so thanks to you!!! Keep posting videos jen... Stay pretty always. Great tutorial, but I'm so clumsy I still can't do it! Ps. How beautiful are you?! I really like your bow hair piece! Where did you get it? I've been following you for awhile now, but this is the first time I commented (of course I would be here in the middle of exam season haha). My hair is unfortunately too short for braids. My hair is a little bit below my shoulder an layered so I am having a difficult time with this. I keep getting confused! Do you have any advice or anything.? This is really good! I'm just having trouble since I have layers in my hair. Is there any other way to do it?